Although every summer is the summer of seersucker, I feel like I wear it more and more each year. This has to be my all time favorite seersucker piece, and you can find it at Caroline dawn. 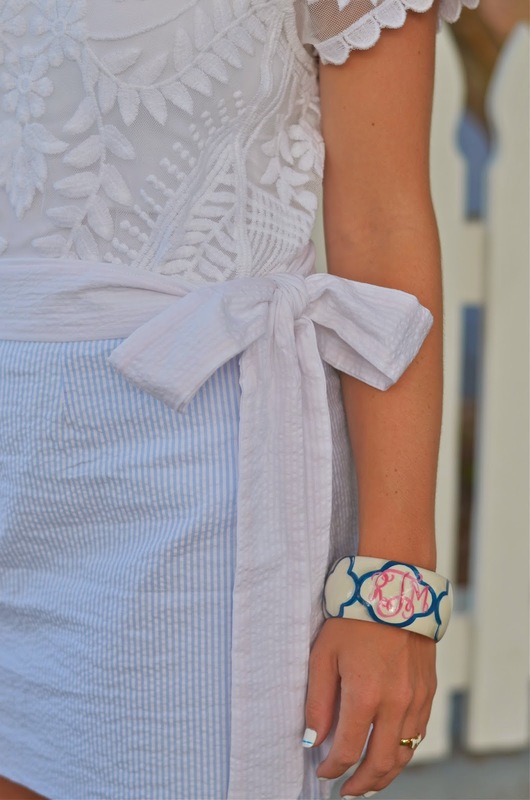 Tying in a bow on the side, this skirt is simply the cutest. I paired a textured (patterned, if you will) top with it to mix things up a little. I also love the idea of pairing it with pale yellow. Caroline Dawn also has the most adorable pairs of shorts (see a feature here)! I simply can not resist a darling seersucker piece. Follow along with Caroline Dawn on Facebook, Instagram, and Pinterest to hear of new arrivals. 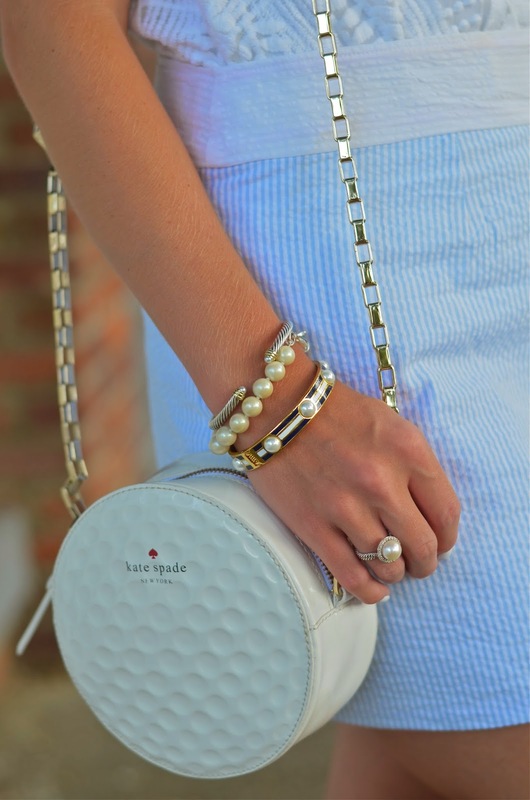 Enter the giveaway with LaMaLu Boutique! I wore a seersucker skirt today too! I love the shirt & skirt combo! Seriously obsessed with this outfit! 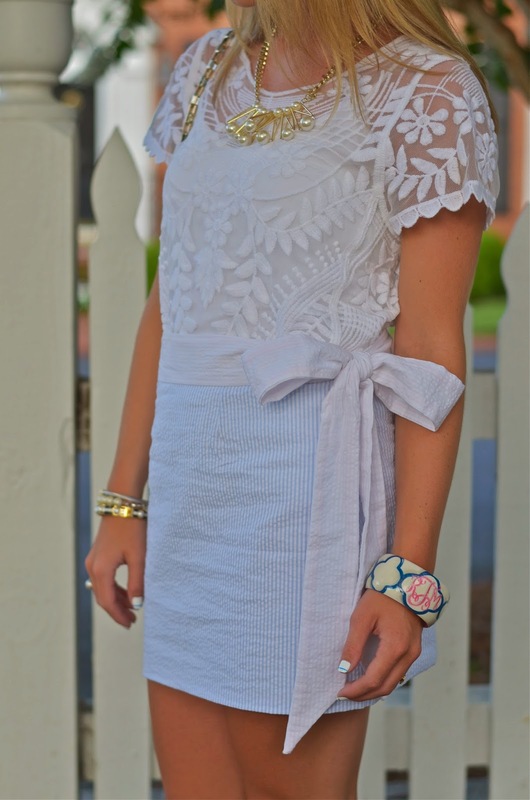 I love the seersucker and lace together! That skirt is so pretty! Have a great long weekend! I mean... why don't I own white Jack Rogers yet?! Great skirt! I have a similar pearl ring that I wear all the time. Love it! That skirt is so cute! Love it! white jacks have been on my wishlist for so long, you've definitely convinced me to purchase!